Send video signal from an existing desktop computer or another source device with a DVI-D video output port to a projector or monitor with a DisplayPort input. This converter is an ideal solution schools, conference rooms, or other workspaces when upgrading to a new monitor or projector. There is no need for an external graphics adapter or extra converters. This simple plug and play converter changes the DVI-D output signal to DisplayPort, no drivers are required for install nor additional power adapters. The all in one dongle style converter provides power from an onboard USB connection and requires no drivers for install. Newer displays no longer offer DVI-D as an input. 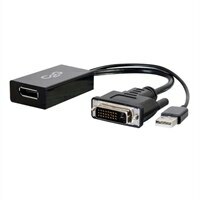 Utilizing this DVI to DisplayPort converter will allow for connection to a brand new monitor or projector without the added expense of updating the graphics card. The dongle style adapter reduces strain on the video port. The cable between the DVI-D connection and the converter provide strain relief that protects the port from strain damage as cords are moved. No need to utilize a power adapter. The DVI to DisplayPort converter pulls power from the DVI-D port bus power. If enough power is not supplied by the DVI port there is a USB plug attached to the converter which provides power as well.